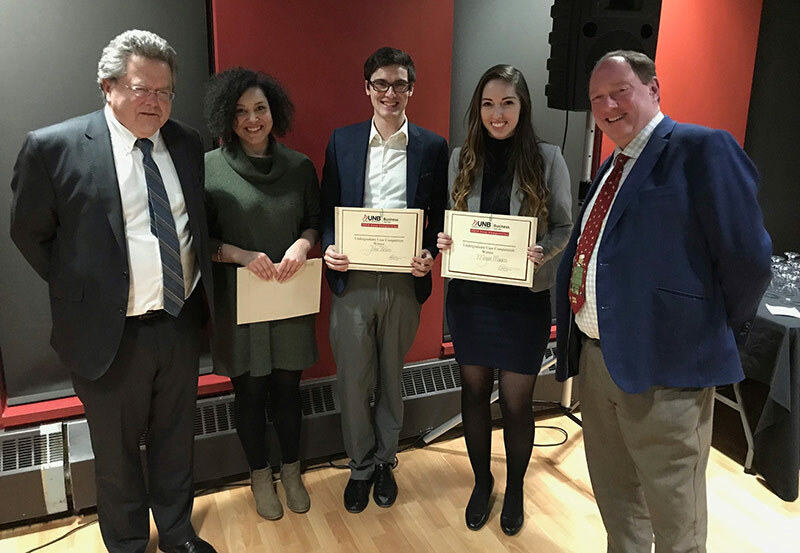 Undergraduate students from the University of New Brunswick Saint John’s faculty of business recently competed in the 2nd annual UNBSJ business case competition. The competition, which began on Jan. 18, lasted a total of 26 hours and was composed of eight teams, with 35 students in all. This was a faculty-wide event and several members of the local business community, as well as fellow students, turned out to show support for the student competitors. Terry Conrod, faculty advisor, Dr. Greg Fleet, associate dean of undergraduate studies, Dr. Matt Wegener, professor of accounting and Natalie Folster, project coordinator, were involved in the organization of the case competition. As part of the competition, participants received a written business case on Friday morning that contained a business problem to which teams had to find a solution. The teams presented recommendations for action the following afternoon, and winners were selected by a panel of six faculty judges. The winning team, the Research Thinkers, took home $1,000 and eight floor seat tickets to the Saint John Riptides home game, which were donated by Gorman Nason Lawyers, a sponsor of the event. The Accountables came in second and took home $750 and Quality Control and Best-Case Scenario tied for third place, winning $500. Megan Morris, a member of the winning team, also found the experience to be of great value. “The UNB case competition gives students the opportunity to test their knowledge in a time sensitive, realistic case study,” she says. Photo: Mr. Fred Welsford (Partner - Gorman Nason), Chelsea Seale (Associate - Gorman Nason), John Wolno (student), Megan Morris (student) and Prof. Rob Moir (Acting Dean Faculty of Business). Photo credit to Mathieu Savidant (student).